"Immediately send ten gas detectors as agreed, price quote to follow." We hereby inform you that two weeks ago we inquired, of five different companies, concerning the display devices for prussic acid [hydrogen cyanide] residues sought by you. We have received negative responses from three companies and two have not yet answered. When we receive information on this matter, we shall immediately contact you, in order to put you in touch with a company that makes these devices." 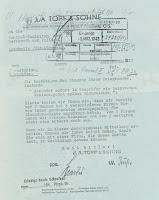 "The gas testers which are mentioned in the photocopy of my letter of March 2, 1943, addressed to the SS-Bauleitung of the Auschwitz concentration camp as shown to me here, were looked for by me at the request of the head of said Bauleitung, von Bischoff, in order to install them in the gas chambers of the camp crematoria. When von Bischoff approached me with the respective request he explained to me that, after the poisoning of the detainees in the gas chambers, there were often cases of vapors of hydrogen cyanide still remaining in them even after their aeration, leading to the poisoning of the operating personnel working in these chambers. Therefore, von Bischoff asked me to find out which companies were manufacturing gas testers with which one could measure the concentration of hydrogen cyanide vapors in the gas chambers in order to render the work of the operating personnel risk-free. I was unable to comply with von Bischoff’s request, because I could not identify any company that would have manufactured such gas testers." "The revisionists dismiss this document by claiming that it is a forgery. The forger must indeed have been a remarkable historian, because he did not only know name and signature of the head of the SS Central Construction Office at Auschwitz, Karl Bischoff, of one of his coworkers, SS sergeant SDS Hans Kirschneck, of the civilian employee Rudolf Jährling who was responsible for technical matters, of the responsible person of department D of the Topf firm, chief engineer Fritz Sander, as well as of the head of Division D IV of the Topf firm (crematory construction), chief engineer Kurt Prüfer. 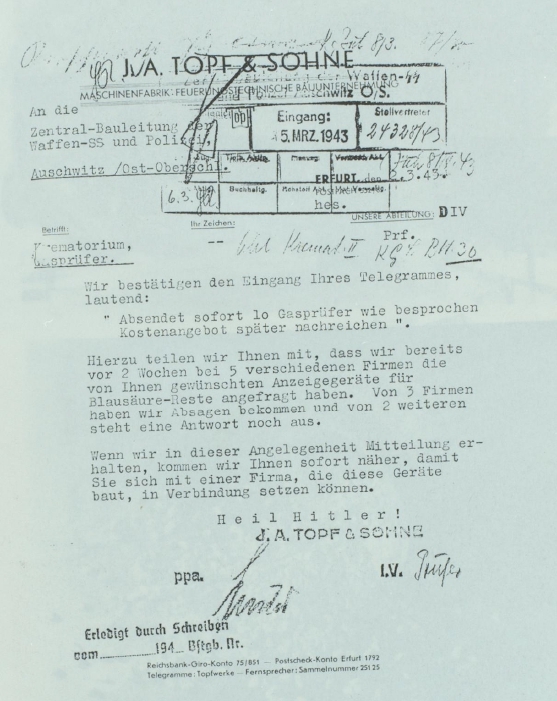 The forger had access to paper with the letter heads of the Topf firm as it was in use in March 1943, to a Topf rubber stamp as well as a rubber stamp and a dating stamp of the Central Construction Office Auschwitz, and in addition to that their complete registry of correspondence, so that the letter could get an exact receipt number. He was also familiar with the administrative customs of the Topf firm and knew who had power of attorney (Sander) and who did not (Prüfer)." b) these devices would have been requested from the camp garrison doctor. Both arguments are weak. Laymen may describe a device technically incorrect and devices may be requested through a channel that is not conform with the usual bureaucratic path. None of these points is pressing to dismiss the letter as forgery or falsification. Moreover, Mattogno did not address the crucial question then, why was the document supposedly forged. Just for fun? Hardly so. As Pressac(?) had pointed out, the forger would have put tremendous effort into carefully fabricating the document and its numerous characteristics. And for what? To prove homicidal gas chambers? 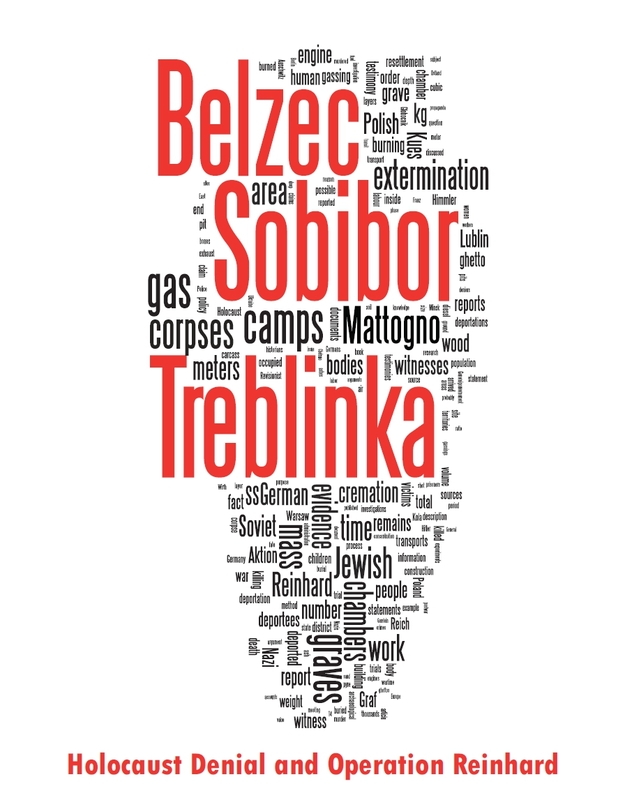 But the letter does not even mention gas chambers let aside homicidal gassing or atrocities. To incriminate Prüfer? But the letter says that Prüfer did not manage to get the gas detectors. It did not mention Gustav Braun either, who was the highest level Topf employee in Soviet custody. The Soviets are supposed to have made up that Millions were gassed in Auschwitz and then they forge a document that says that Prüfer looked for gas detectors but couldn't get them. Seriously? The lack of motive is a knock-out for the forgery hypothesis. "For all these reason [sic] the Topf letter of March 2, 1943, is at least suspicious. Although it seems formally authentic, its content is utterly untenable." "What does that mean? I don’t know." Perhaps Mattogno can explain it again? "Regarding the content, in fact, the document in question has no value, no more than a military document that mentioned a flying attack donkey." Yeah, this I already understood from ATCFS above, the content of the letter is supposed to be "utterly untenable". But what does that mean? The content of a source is not simply utterly untenable, it is so for some reason. The "flying attack donkey" in a military document might be a code word, a joke, a creation of somebody on dope. But why did Prüfer sent a letter to the central construction office Auschwitz with utterly untenable content, writing about "display devices for hydrogen cyanide residues" when he actually meant "smoke gas analyzers"? It doesn't seem like a code word nor like a joke (the document was signed by another Topf engineer Sander, maybe they smoked the same weed?). It makes little sense to assume that Prüfer wrote a letter with allegedly utter untenable content to the Auschwitz SS. Nor does the forgery hypothesis make any more sense. But then there is only one likely conclusion left: Mattogno's understanding of the document, which is by far the weakest element here, is false. "So it is not true that I leave the matter “in confusion”: it is the document that creates confusion." Nope, it's Mattogno's interpretation of document and context that creates confusion. And to clear up the confusion, he would need to revise his interpretation. "Secondly, Prüfer speaks of “Ausrüstung” (in Russian: “oborudovanie” 177) of the Gasprüfer in the alleged gas chambers, as if they had been mechanical monitors one could permanently have installed somewhere." But this could be exactly what the construction office might have wanted: to install permanent gas detectors in the gas chambers of the crematoria to monitor the gas concentration. 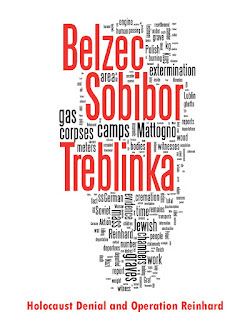 The number of 10 detectors compared to the number of 6 to 8 homicidal gas chambers in crematoria 2 - 5 might suggests multiple use in some chambers or that it included the Bunker extermination sites or even delousing facilities. And exactly because such more sophisticated devices were not available from the camp garrison doctor (who only received chemical indicators from the Zyklon B supplier), the construction office may have asked Topf to get these quickly and unbureaucratically for them (or alternatively, it was an initiative from Topf to begin with agreed upon by the central construction office - in contrast to Prüfer's testimony). It must have been thought that such gas detectors for hydrogen cyanide should be easy to get, as the construction office requested Topf to dispatch these devices only days or weeks after they discussed the issue. And exactly because such physical gas detectors for hydrogen cyanide may have been not developed or sold yet, Topf only received negative replies from the companies they approached. The Topf letter on the "display devices for hydrogen cyanide residues" for crematorium 2 is beyond reasonable doubt authentic. It is formally correct, it fits into the context of installing hydrogen cyanide gas chambers into the crematoria, its authenticity was confirmed by the author and there is no sufficient motive for a forgery. If the letter contradicts some of Mattogno's ideas and assumptions, then this is more likely because his own understanding of the document and its context is flawed rather than it is a forgery or was written by Prüfer simply with "utterly untenable" content.